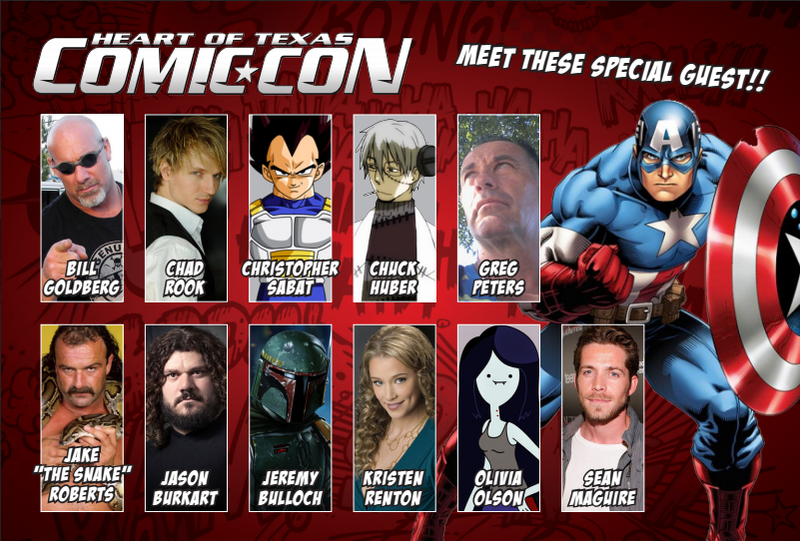 Heart of Texas Comic Con is On! Are you ready for HOTCON 2015? It’s just around the corner and will be back in Waco, TX on March 20–22 at the Exhibits Hall & Creative Arts Building of the Extraco Events Center. Filled with fun for the entire family, HOTCON 2015 will have everything from your favorite celebrity guests, to cosplayers, to vehicles from popular TV shows, comic book artists with credits from Marvel, DC, Warner Bros, Disney, Hanna-Barbera and more. Come meet the Teenage Mutant Ninja Turtles or Jack Skellington from the Nightmare Before Christmas. Wear your favorite costume to the show and enter our cosplay contest, get your picture with the Impala from Supernatural, or get a crazy amount of loot from the artists and vendors. There’s so much to do it will take the entire weekend to pack it all in your schedule. Celebrity guests will include the wrestlers Bill Goldberg and Jake “The Snake” Roberts. Sean Maguire and Jason Burkart from Once Upon A Time will be appearing. We’ll have voice actors like Christopher Sabat and Chuck Huber from Dragonball Z and Olivia Olson from Adventure Time and Phineas and Ferb. Also, Chad Rook the Weather Wizard in CW’s The Flash, Jeremy Bulloch as Boba Fett from Star Wars, Kristen Renton from Sons of Anarchy, Darren Davis the owner of the largest independently owned comicbook company Blue Water Productions, comic book artist John Lucas with credits from both Marvel and DC, and Waco’s very own celebrity artist Greg Peters with credits from Hanna-Barbera, Disney, and Warner Bros. You won’t want to miss this fantastic lineup of guests. Be sure to catch the free Q&A sessions for these celebs and get an autograph and photo op with them.